Ideally involve the entire congregation in setting goals and direction; if not the whole church, then the witnessing or evangelism team. Initially begin with a 12-month evangelistic strategy. Be detailed in giving assignments to evangelistic personnel. When there is doubt or confusion on the “what”, “when”, or “how” to do something “goals may be slowed or halted”. These strategies involve the will of man instead of seeking the will of God. A successful strategy is one that aligns with the will of God. There needs to be a prayerful commitment to seek the will of God; submission to do the will of God, and prior to the effort or event, prayers to prepare the way, including softening people’s hearts in order that they may be able to receive and believe the gospel message. This week’s lesson started with looking at Jesus’ two-fold statement to “follow me and I will make you fishers of men”. Jesus rightly should be the Commander-and Chief of every evangelistic effort. On this final day of study, I see man-ordained strategies being implemented with no re-enforcing thought to prayerfully seek Godly counsel, and the necessity for Him to lead the effort. Strategies are the focus, not God, the gospel, or saving the lost. God and the gospel are not mentioned. 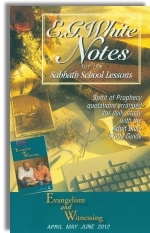 However, it is interesting to note the class is encouraged to read and receive inspiration from Ellen G. White. 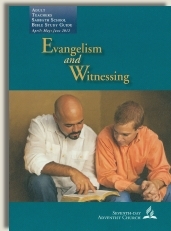 In addition they are to discuss and evaluate other successful evangelistic endeavors. The week ends with a focus on the strategies of man instead of aligning with the strategies of God; His will in spreading the gospel. We need to know and understand the gospel story of Jesus. We need to believe it and know we are saved. We also need His direction, His leading, and His empowerment. Formulating a strategy apart from Him is futile.